Resilient. That’s the only thing we can say about the stock market’s performance in light of the day’s headlines. Netflix, the darling stock of the year, is down 10% on the day. The company delivered a big fat miss in its quarterly numbers. As we mentioned during earnings season three months ago, Wall Street’s “professionals” don’t care about sales or profits when evaluating NFLX’s numbers. They care about new subscribers. And during the current earnings season, the company missed its own forecasts by more than 1 million subscribers. Oops. When NFLX reported after the closing bell yesterday, it looked as if the bad news was going to drag down the rest of the tech sector today. Not so — at last check the Nasdaq Composite is slightly in the green. At 7,816, it’s only 10 points off its record close last Friday. That’s resilient. Here’s another sign of resilience. This morning’s Wall Street Journal has a front-page story about BlackRock, the world’s biggest asset manager. Investors poured $20 billion into the company’s funds and other products during the second quarter. Which sounds massive, and it is — but not compared with $100 billion a year earlier. These numbers matter because BlackRock runs the hugely popular iShares ETFs. For years, investors have piled into low-cost ETFs that “passively” track an index like the S&P 500 — as opposed to high-cost “actively” managed funds where a human being picks the stocks. If money flows into ETFs are slowing, that says investors are getting skittish about the market in general. Which makes sense, given the volatility that hit the market starting in early February after a long, steady climb. It’s not just BlackRock: State Street experienced a $7 billion outflow from its popular SPDR ETFs in June. And yet… the S&P 500 hovers around 2,800 here in mid-July — a mere 2.6% off its record close on Jan. 26. That’s resilient. But the media keep falling back on the trade war as an explanation for everything. Dow down 200 points? Must be the trade war. Interest rates rising? Trade war. Amazon’s site crashes during the first hour of Prime Day? Gotta be the trade war! Whatever. You can spend the rest of your days tuned into the media noise and never make any money from it. In contrast, you can spend an hour with the aforementioned Alan Knuckman tomorrow… and it could change your life. That’s when he’ll walk you through a new three-step system to secure your retirement — starting with an opportunity to collect $6,754 by next week. Yes, we’re going to try to sell you on a premium service. (How’s that for transparency?) But don’t think you lack the resources to execute the trades. “This strategy is available to all income groups,” says Alan. “No worries if some investors don’t have thousands of dollars available to buy a large lot of dividend-paying stocks in order to collect a 2–5% dividend. To learn how to collect that massive upside, we urge you to join Alan for his “Fast Fortunes Summit” tomorrow at 1:00 p.m. EDT. If you have to rearrange your schedule, we promise it’ll be worth the trouble. Interest in this event has been huge — enough that we’re capping the number of new spots. Only 200 per hour. That’s because he’ll be talking about a specific recommendation — the one that could deliver $6,754 by next week. Sign up right here to guarantee your spot. “We’re in a special environment with two big catalysts for the market,” says our income specialist Zach Scheidt. Again, it comes down to the trade war chatter. “Investors are acting as if a full-blown trade war is a foregone conclusion,” Zach explains. “And so prices for most stocks affected by trade war challenges have moved to very low levels. That leaves us with plenty of room for these stocks to rebound and not that much room for them to trade any lower. “The second catalyst is the strong economy that is helping companies grow earnings. “Lately we’ve seen some very strong job numbers that indicate corporations are hiring more workers and paying them more money. The only reason these companies would be investing in workers like this is if they’re growing profits and have new opportunities for new employees to work on. Speaking of economic growth, the nation’s factories are humming again after a springtime hiccup, according to the Fed’s latest figures on industrial production. Manufacturing activity jumped 0.8% in June — which helped reverse a plunge in May driven by a fire at a parts supplier in Michigan, gumming up the supply chain. Mining production — a category that includes oil drilling — jumped 1.2% for the month. Combine mining and manufacturing with utilities and the overall industrial production figure rose 0.6%. The other notable economic number of the day is homebuilder sentiment: The Housing Market Index from the National Association of Home Builders clocks in at 68. The number’s been trending down for seven months now, but it remains at historically high levels. Back to Netflix — because NFLX is key to a stock market myth Agora Financial contributor Mike Burnick is eager to bust. The myth is that market “breadth” is weak right now: That is, a handful of stocks are propping up the market as a whole. Typically, that’s a bad sign for the market as a whole. “I heard the latest sky-is-falling story a few days ago,” Mike tells us, “when CNBC reported that just three stocks — count ’em, only three — have accounted for over 70% of the stock market’s gains this year. “Specifically, Amazon, Netflix and Microsoft are together responsible for 71% of the S&P 500 Index returns year to date. “As you can see above,” Mike explains, “the number of advancing stocks compared with declining shares on the NYSE is clearly making new highs, even though the Dow and S&P 500 aren’t. 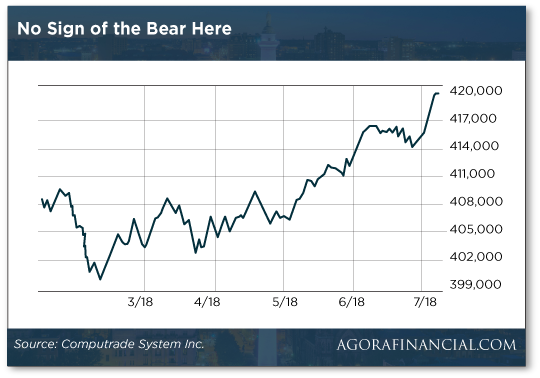 “That’s a bullish sign that tells me most of the 1,900 stocks in this broad market index are moving higher, not just a few high-profile stocks. Conclusion: “It’s no surprise these leading tech stocks have accounted for the majority of the S&P’s feeble gains year to date.” But it’s not a sign the end is near. Aaaand… gold has decisively cracked through the critical $1,240 level. The excuse for the selling is Federal Reserve Chairman Jerome Powell — who’s testifying before Congress. “Incoming data show that, alongside the strong job market, the U.S. economy has grown at a solid pace so far this year,” he says. Thus, the Fed “believes that — for now — the best way forward is to keep gradually raising” interest rates. That’s not a dramatic shift in policy. But traders hit the “sell” button regardless. As we write, the bid is down to $1,227. As we said yesterday, chart-watchers say there’s near-term support just above $1,200. But the tumble below $1,240 marks a break with gold’s constructive price action going back its bottom at $1,050 in late 2015. Damage like that will take time to repair, we suspect. Now for a hard-won victory in a case we’ve been following since 2012. It was in that year when a 24-year-old Texan named Cody Wilson developed a firearm you could download and make using a 3D printer in your own home. That’s the American spirit of ingenuity. The plaintiffs’ lawyers made a First Amendment argument — “I know people make it about guns, but it’s about free speech,” says attorney Josh Blackman. Note well: The settlement does not change the federal law that says you can make a firearm at home only for personal use, not for sale. 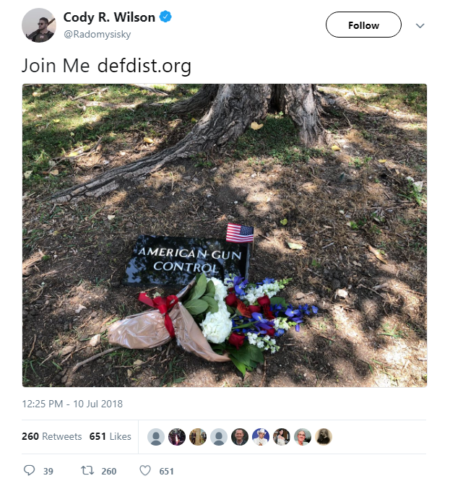 [For whatever it’s worth: We were unaware of the Second Amendment Foundation until this week. Seems like an intriguing organization. That said… if you play your cards right and get connected with the right people, being an economist can be pretty damn lucrative. Look at former Fed chief Ben Bernanke. The first speech he gave after stepping down in 2014 delivered $250,000. He’s collected speaking fees as high as $400,000.